If you want to hire the best company to help you sell a home, start by selecting a company that has a prominent real estate blog. The lessons learned while writing this real estate blog has taught me so much about what consumers are doing every day on the internet. I have written a daily real estate blog since 2007, and by my count, the number of real estate blog posts that I have written is right around 1,400. 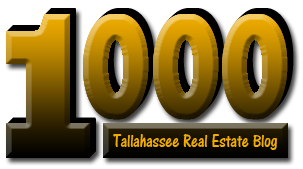 But for this version of Tallahassee Real Estate Blog, today's article represents number 1,000. Long time readers of the Tallahassee Real Estate Blog know that I've been talking about a complete sight redesign that I hope to undergo in the next few months, which will coincide with the release of Thesis 2.0 (the nuts and bolts of my website). I started this second version in December 2009 and now it is time to evolve to version 3 in order to take advantage of what I have learned about selling homes over the past two years. First of all, a real estate blog does not actually sell homes. A least not very often. A real estate blog helps me interact more closely with people in the Tallahassee real estate market, and this interaction gives me wonderful, timely feedback about the thoughts and concerns of today's home consumer. But there is also the technical education that comes with writing a daily real estate blog, learning about how to increase traffic (exposure) and how to find the buyers in a huge international pool of people "just looking." I would never have guessed that this was possible six years ago, but the combination of the technical knowledge as well as the insight on today's consumer behavior have completely changed the way I go about selling a home today. So why do you select a company with a prominent real estate blog when you need to sell a home? We know (based upon a recent, not-so-surprising NAR survey) that 94% of homebuyers are using the internet when they buy a home. Common sense suggests that the heart and soul of a great home selling plan then would be built to take advantage of known homebuyer behaviors on the internet. Through our studies, we know that buyers spend months "just looking" as information seekers and then as comparison shoppers before they are ready to buy a home. Real estate is local, and most "ready buyers" end up on the most-trafficked regional real estate site. The most trafficked regional real estate site will typically be built around the most prominent real estate blog in the area. You see, you get to "think like a homebuyer." If you do what they do, then you will discover where the "ready to buy" homebuyers go each day. If you hire that company, they will get you better targeted exposure of your home to the people who are now ready to make a buying decision. After writing thousands of real estate blog articles on the internet, Google will show you that the Tallahassee Real Estate Blog is by far the most trafficked real estate site in Tallahasseee. If you would like to see a demonstration (proof) of the benefits of marketing your home for sale with Joe Manausa Real Estate in Tallahassee (home of the Tallahassee Real Estate Blog), just drop me a note and we'll schedule a time to show you how it is done.